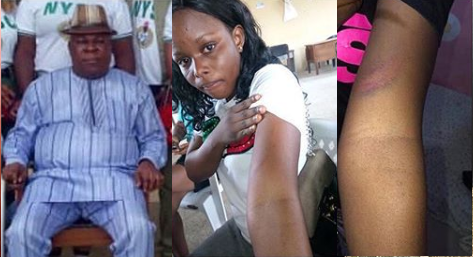 Mr Friday Udoka, the Principal-General of Government Technical College, Abak, Akwa Ibom State, has apologized for flogging a serving female corps member in the school, Miss Olaitan Adeola Kolawole. Speaking at the NYSC state office yesterday in Uyo, Udoka said he did not deliberately flog the corps member, noting that he used the cane on her out of anger. The principal who has just three years to retire from service was said to have flogged Kolawole for the “misdeamour” and dragged her outside the classroom in front of the students; the allegation he denied. “For an elder to apologize for his mistake, I forgive him. I accept his apology. My parents wanted to take up the matter, but I will talk to them not to pursue the case as they wanted”. NYSC Coordinator Mr Amusu Julius said he was writing his report on the incident to brief the corps directorate, but had to stop because the Commissioner for Education asked that a reconciliation be arranged between the parties involved.